Morse High School’s two 20-something music teachers may have been untested rookies when they arrived, but the respect they’ve gained from the students, teachers and parents in their 18 months here is universal. Both came to Morse in September 2001. Anthony Marro, 25, the band director, runs efficient, methodical rehearsals that have his student-musicians sometimes playing just a few notes over and over again until they’re perfect. By singing the notes – “da ba la la, da” for example – stomping his foot, snapping and clapping, Marro projects exactly the sound he wants. When the students succeed, he praises them. When they don’t, he tells them so. Matthew Fogg, 24, the chorus director, is more prone to alternately sitting at the music room’s grand piano – his forte, so to speak – and jumping up in front of a group of singers to help with pronunciation and phrasing. On a Bach piece during a recent rehearsal, Fogg spent several minutes teaching the students how to say the words correctly in German, breaking a one-syllable word into three sounds. Before the students begin, Fogg sings their notes for them – even though some of the parts, particularly the sopranos, are far out of his vocal range. To say Fogg is full of gusto is a half-truth, said his students. The student said both teachers are worthy replacements for their predecessors, David Aines in band and Wendy Ulmer in chorus. Aines, the 2001 recipient of the Dr. Patricia Ames Distinguished Teacher Award, moved away with his family, and Ulmer switched to teaching English at Morse. Fogg and Marro have common goals for the music program, which start and end with giving the students the best music education possible. Along the way, they hope to expand the students’ musical tastes across the genres, classical to contemporary. Both lead musically active lives outside the classroom. Fogg moonlights as a jazz pianist, playing with a variety of ensembles, including full bands and sometimes solo vocalists. Marro, a woodwind player is a saxophonist for the Terry White Big Band among other groups, and also writes his own songs. Marro, of Portland, attended South Portland High School before earning a music education degree from the University of Southern Maine. 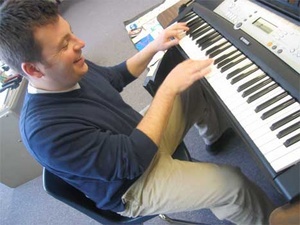 Fogg, who lives in Bath, attended Biddeford High School and earned his music education degree from the University of New Hampshire in Durham. Both were hired in Bath at a starting teacher’s salary, about $25,000 a year. Both are still single, and they admit they’re still adjusting to their new careers. Since they joined the school, the two new music teachers have started a music theory class and have plans to add a keyboard laboratory, but perhaps their biggest accomplishment was the formation of a new music booster group to help pay for what the department budget can’t afford. This is especially valuable now, said Morse Principal Paul Pendleton, because of the budget situation in the city, which last year forced all departments to cut spending proposals by hundreds of thousands of dollars. This year, all department heads were instructed to submit proposals with no increases, but Pendelton said that didn’t dampen the spirits of Fogg or Marro to expand and enhance their programs. Trombone player Petra Hamilton-Denison, a junior, says she has never had a band teacher like Marro. Much to her regret, Hamilton-Denison and her family moved last week to a town outside the reach of the Bath school department. Sally Davis of West Bath, who has two daughters in Bath schools and who is a member of the music boosters club, said she was worried not so long ago about the prospect of Aines and Ulmer leaving and the effect it would have on the music department.